HOW DO WE BUILD RELATIONSHIPS THROUGH MUSIC? BLOOD DRUM SPIRIT ENSEMBLE EXPLORES! The members of BDS are pianist Art Hirahara, saxophonist David Bindman, bassist Wes Brown, and percussionist Royal Hartigan. 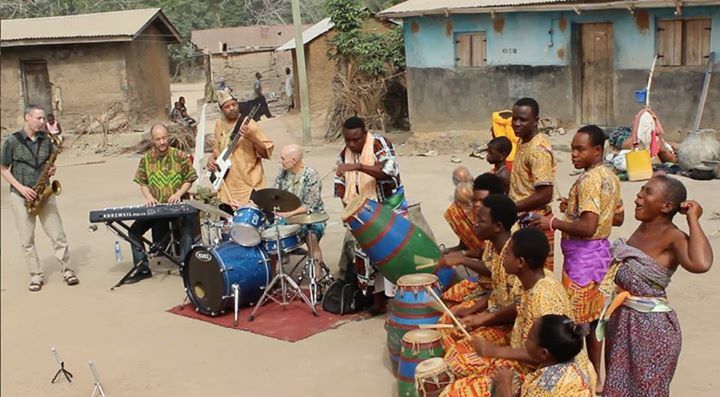 “We lived in each village, worked on the music, and recorded original and historic jazz compositions connected to the traditional dance, music, and songs of the communities we visited. 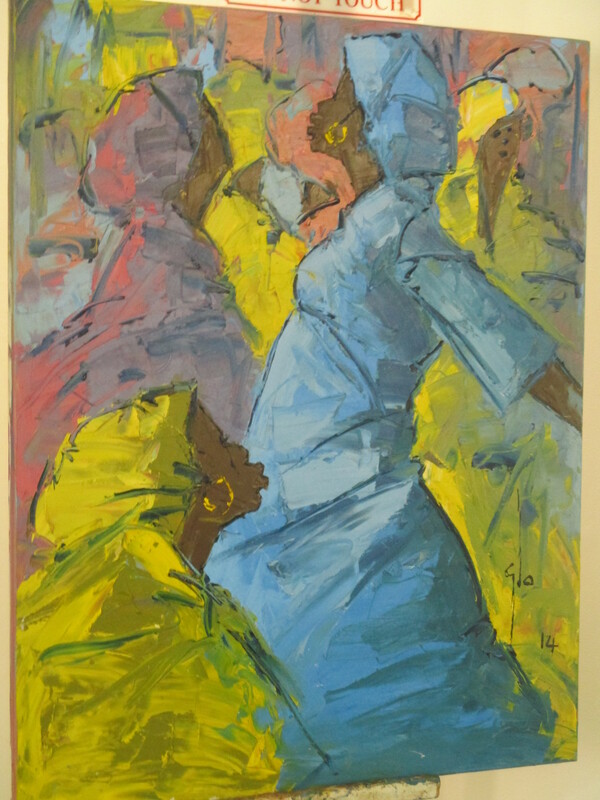 the compositions and improvisations were a result of years of study and performance with Ghanaian master artists. We thank all the performers. Our motivation is to assist in connecting the deep spirituality of African and African-American cultures through music and dance. We experience and help express this transcendence to honour the peoples of Africa, America, and all peoples on earth as sisters and brothers in the human family.” Royal Hartigan says. Permission was given for recording and non-commercial educational online use by the following master artists and elders: Abraham Kobena Adzenyah, Emmanuel Kwaku Agbeli, Kpeglo Ladzekpo, Olu Nudzor Gbeti, E. K. Yevutsey, Edmond Tijan Dorwana, Sulley Imoro, Daniel Annan Sackey, Erik Owusu, Nana Owusu Gyasi, Nana Boakye, Nana Obeng Gyasi, Yaw Daniel Okyere. Videography was undertaken by Martin Adi-Dako, Simon Asamoah, and Ben Cohn. Support was given through the hospitality of Mr. Daniel Fennell, of the U.S. Embassy and Fulbright director in Ghana. Dagbe Cultural Centre: Director, ensemble leader, and master drummer, dancer, vocalist, and trumpeter, Emmanuel Kwaku Agbeli. The Dagbe Cultural Centre is open year-round for people to experience and learn traditional culture, language, visual arts, dance, song, and drumming. Emmanuel is carrying on the Dagbe tradition from his late father, Godwin Kwasi Agbeli. For information please contact Emmanuel at (+) 233 243539871 or dagbekopeyia@hotmail.com. Tijan Dorwana, Isaac Dorwana, and Ben Ba-ere Yotire, gyl xylophones and drum; Maxwell Dorwana, Emmanuel Nureban, Faustina Sabo Dorwana, Mary Bilyin Dorwana, Emelia Dorwana Tielier, Atsu Aborchie. Dancers. Master drummer Yaw Daniel Okyere, donno; dawuro bell player Papa Yaw. 16) Komfour Abena Amponsah, and trainee to be priestess. Mr Emmanuel Kofi Gyasi, Nana Obeng Gyasi’s father. Nana Obeng Gyasi is the chief priest and the leader of the Bodwese shrine, located at Penteng in the Asante Mampong area of the Asante Region of Ghana. Penteng can be found on google maps as Penton. African Tradition is real, unique and true. It is our culture and it’s reflected in the beauty and hospitality it brings in time of playing the drums, everyone can participate, meaning you can enjoy the dancing. People of all backgrounds can enjoy and be a part of the music and dance. For further information, you can contact the chief priest, Nana Obeng Gyasi on 00233-244808395 or 00233(0208198302). You can whatsapp him on both lines. Or by E-mail, at darlingpriest@yahoo.com. Author Kwame 'Write' AidooPosted on February 28, 2015 February 28, 2015 Leave a comment on HOW DO WE BUILD RELATIONSHIPS THROUGH MUSIC? BLOOD DRUM SPIRIT ENSEMBLE EXPLORES! EVENT REVIEW: THE SAKORA RECORDS AND A.R.T. VOL 1 LAUNCH; EVENT OF SOUND SUCCESS! The Afro Harmony band has that droning ecstatic bliss from guitar effects and shuddering rhythm sections to keep a show going till it hits the acme and even then the spirit of the music celestially pours like libation and every one in the audience goes on to cheer as they receive their ear-share abundantly. I’ve been observing their perfection gradually build momentum after each event since they backed the rapper M.anifest‘s first ever concert in Ghana in 2012 at the now non-functioning event space Taverna Tropicana. The Sakora Records Launch, another epic La Paillote Takpekpe edition at Alliance Francaise after The Write Experience served a packed house good music aside poetry, dance and live graffiti in January. Every last Wednesday of the month, La Paillote Takpekpe offers a local emerging artist a grant and space to put together a creative programme and this has over the years garnered much appeal, mutually putting a feather in the cap of the generation of young creative artists having the chance to be cultural directors as well as promoting the brand of the venue sponsors. At the Sakora Records Launch concert, the guy behind the drum set always kept his cool exactly knowing what to do as supported by another just next to him on a set of traditional drums; 2 Atumpans and a reddish djembe in the middle though he had some maracas and another instrument that looked like rumba shakers which magically appeared in the middle of performances to add some spice. A deck of two keyboards manned by this guy with a hoodie on his head and 2 guitars; bass and lead handled majestically by one guy to the far left and to the far right, producer and multi-instrumentalist Sewor Okudzeto; the leader and founder of Sakora Records respectively. The melodic guitar motifs and an adowa or sometimes kpalogo-drum style drive, with keen keyboard inflections and the kind of sharp snare smack and taut beat the band delivered was sizzling already before the Nigerian vocalist; Sister Soul got on stage and did a good 10 minute performance. Yasmeen and Lady Jay‘s collaborative ‘Propaganda’ political piece right afterwards raised the pitch and allowed the audience some room to indulge in the art by adding their voices and rising up on their feet to kick in with hand sways and boogies. Lady Jay owned the stage right after, introducing herself as “FKA(formerly known as) Lady jay Wah” and immediately had her magical voice propelling listeners into another world. “Black is Beautiful” followed by a love song ending in “Nana Yaw, me do wo (Nana Yaw I love you)” had the audience in a frenzy. The adowa-inspired “aba asem” followed by “I’m doing fine” gave her more nods than a serial awardee. Kweku Mankind ‘killed’ the stage totally with “okwaadonto” right after, leaving a heated audience some room to digest Yaa Pono‘s highlife fused with rap performances. “Maa sisa” soaked into people’s ears and hearts, but “Light off in Dzorwulu” even cut in cleaner. The musicians exhibited a calm but serious air, to create rhythmic mantras that started slowly, in awesome washes of ambient guitar and keyboard effects, but built a relentless concise touch as we in the audience thought it could go on for ever. This kind of aesthetic purity, aided by simple yet intense red or blue and white lighting and good live sound should be exactly how most Accra night shows should go. Panji Anoff; the CEO of Pidgin Music was present, not forgetting King Ayisoba as seen in his grand batakari in the audience tailed by kologo-playing colleagues, culturally adding to the ambience. Efya, the talented songstress was also present as well as P. Y. Addo Boateng of the Viasat TV One Show fame, all in full support of the performers and producers of the Sakora Records Launch. Author Kwame 'Write' AidooPosted on February 27, 2015 February 27, 2015 1 Comment on EVENT REVIEW: THE SAKORA RECORDS AND A.R.T. VOL 1 LAUNCH; EVENT OF SOUND SUCCESS! Ghana’s poetry and spoken word movements keep making strides each and every year. More than a few places in Accra and more recently Takoradi and Kumasi serve as open mic platforms where word artists meet almost every other week to share poetry about their society, inspirations, aspirations, love, etc. Some artists take their art to church as a form of evangelism. Some have gone as far as hitting the streets and public areas such as Kwame Nkrumah circle and the Accra mall in the form of flash mobs to make manifest their vocal style of creative activism. Ghanaian poets have been invited to conferences, seminars, meetings at embassies and corporate circles as well to share their works. Quite recently, one of Ghana’s foremost poets Mutombo da Poet visited the US where he toured a few states and shared his art. The new age of digital technology also keeps word artists on their toes as they share poetry videos, audio recordings and texts easily for the viewership of friends and enthusiasts. This brings us to the question, what happened to the conventional/traditional method of publishing? But surely, that’s a topic for another day. Here I share with you the product of the proficient passion of an 11 year old Ghanaian poet who goes by name Nana Yirenkyi. I met him some 2 years ago through a good friend and fellow young poet Koo Kumi from Mampong in the Eastern Region. Weeks later he was ready to compete at the 2013 Teen Slam Ghana Competition and won. 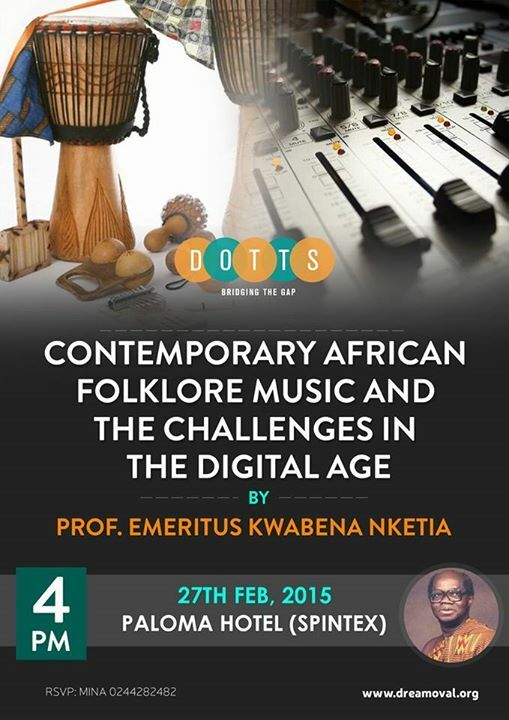 Emeritus Professor Kwabena Nketia, world acclaimed composer, musicologist and contemporary artist, will be the guest at the monthly series DOTTS to deliver a talk on the theme “Contemporary African Folklore Music: The challenges in the digital age”. Prof. Nketia has been described as “easily the most published authority on African music and aesthetics”. He will speak about the connection that the digital age has with music of African origin. He would as well break down the challenges a generation is dealing with putting across the contemporary folklore music in an information era where the internet and data are ever so powerful. Born Kwabena Nketia on June 22, 1921 at Mampong, then a little town in the Ashanti Region of Ghana, he went on to pursue his first musical education, and eventually trained as a teacher at the Presbyterian Training College, Akropong Akwapim – where he later taught and was appointed Acting Principal in 1952. Through a Ghanaian government scholarship, at 23, he went to the University of London to study for a certificate of phonetics at the School of Oriental and African studies.He went on to Birkeck College in 1949, University of London, and Trinity College of Music, London, to obtain his Bachelor of Arts degree. In 1958 he came to the United States, attending Columbia University, Juliard School of Music, and Northwestern University to do courses in musicology and composition. After a year in the United States, he returned to Ghana where he rapidly rose through the ranks at the University of Ghana, Legon – from Senior Research Fellow (1962), to Associate Professor, and finally a full professor in 1963 and was appointed Director of the Institute of African Studies in 2 years. Prof. Nketia is to African music what Bartok is to Western music. How does social media affect the production, distribution and acceptance of music of African origin? How can we harness, promote, and drive contemporary African folklore music to the present generation? Venue: Paloma Hotel, on the Spintex road. Please RSVP with Mina @ 026-3775030 to confirm your attendance. Attendance is FREE, we hope to see you there. BLITZ GOES LIVE IN ACCRA WITH THAT HIGHLIFE INSPIRED HIP HOP! Last two years it was one of the biggest shows that brought Accra to one spot, Alliance Francaise d’Accra to vibe with the Ambassador. Last year it was nonetheless a mega show that had a packed audience at the same venue on their feet asking for more after Mr. Bazawule had done a full 2 hour set backed by members of his original band; a crew he had worked with since his breakout days in Brooklyn and toured with around the world, not forgetting a few talented Ghanaian instrumentalists syncing in effortlessly. Art, craft and design embody some of the highest forms of human creativity and one can easily mark out all 3 in Blitz‘s works as he treats the stage as his canvas, journey pathway and storytelling ground at the same time exploring his roots, routes and rhythm. He journeys with the audience as the pilot buckled in the Accra plane and rides with us from the start to finish. That elegance of connecting with an audience by building rapport, making the observers allies, emotionally making them feel they’re part of what’s going on makes them more likely to pay attention and to cooperate with you. That’s exactly what happened unceasingly throughout the about 2 hours live performance. AFRICA IS THE FUTURE. NO! AFRICA IS NOW! Blitz had been to Zanzibar and Nairobi as part of his Africa Tour. Accra being his homeland and last stop is remarkably a powerful message. He pauses at some point while performing and dialogues with the people about social issues like ‘dumsor’ and corruption which is making the Ghanaian more and more pessimistic about their country. 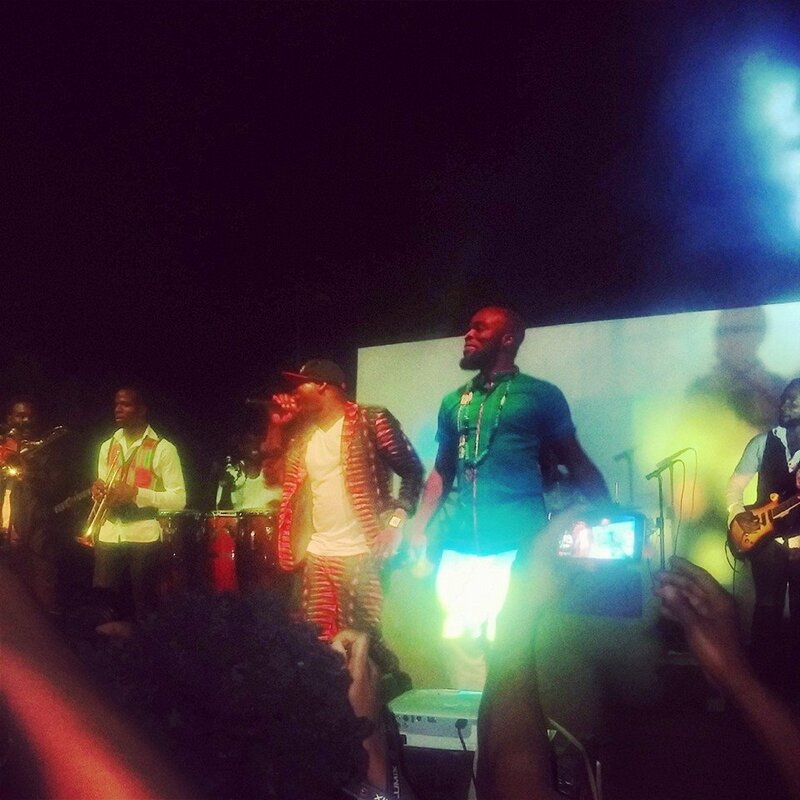 The audience had to impersonate Seun Kuti and we sang our hearts out! Brutality my brothers no get option/ …………..
We waved our hands from left to right! ‘Success’ is that tune that gets all ears sticking out to soak what’s next. 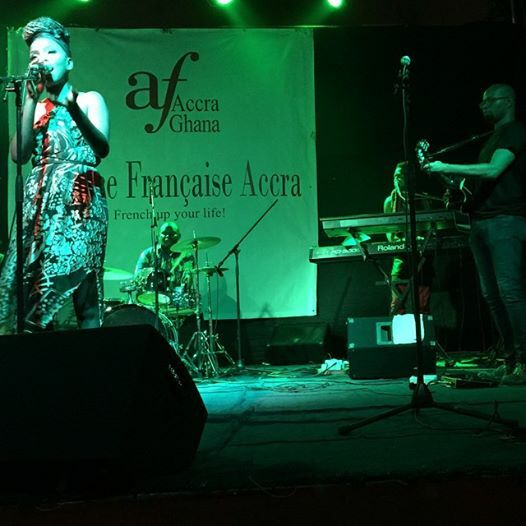 The 7-piece thorough Ghanaian-artists-band rocked hard. Eli, the saxophonist jitterbugged agbadza because the music got into his clothes and he had to shake it out! “I got so much trouble on my mind” echoed through the ‘wahala’ song. The cadence is ever unique when Blitz lays it down with fast tempo stanzas and it’s definitely essential that one puts their ear to the rhymes filled with stories of a past, the present and a future of culture. Identity is not lost on this well-traveled musician and his socially conscious food for the soul makes him one of the best icons to ever do it. When the brother M.anifest joined Blitz on stage, it was pure musical fire and spirit-charged amusement he brought. ‘Dikembe’ shook the place and echoed that classic boom-bap sound distinctly New York raw rasping melody with distorted guitar riffs running through the spine of the music. It’s essential that a generation does not lose the good sense of music and that’s the revolution Blitz brings to the table. Highlife music was nurtured with the same jazzy horns and multiple guitars that feeds into Blitz’s music, keeping that uptempo, synth-driven sound intact as well. Blitz brought enough CDs, Accra City Blues T-shirts and even vinyl records for sale. The Yoyo Tinz and Accra [dot] Alt teams were ever supportive throughout the preparation and the event itself. Steloo closed off the show with wild mixes and Blitz stayed to autograph and take pictures with everybody out there who wanted to get in touch. I thought that was so human and practically fundamental. Oya! Blitz ‘make you no forget’ we should see you next year or even earlier oo! Author Kwame 'Write' AidooPosted on February 22, 2015 February 24, 2015 Leave a comment on BLITZ GOES LIVE IN ACCRA WITH THAT HIGHLIFE INSPIRED HIP HOP! In January this year the National Museum showcased a collection of paintings dated 1940-1990 to celebrate the art of Ghanaian vintage painting while displaying the captivating artistic genius which are undoubtedly important aspects of artistic production and cultural heritage in Ghana. It is not emphasized enough that there used to be this faux opinion of some early European writers about African art being fetishistic, primordial or primitive, etc. These have come about as a result of lack of understanding of the endemic ways which are rather rooted in interrelated indigenous ways of life of Ghanaians and Africans at large. In the exhibition, the National Museum portrayed Ghanaian Contemporary Artists as vast and varied in their artistic media, techniques, methods and thematic expressions. Painting as a visual art form whether formally or informally practiced, transcends culture and creeds. 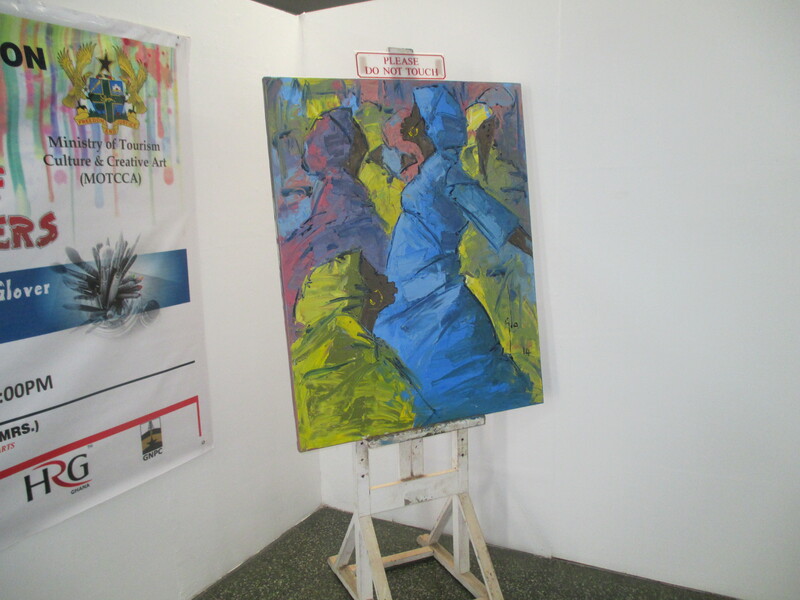 The exhibition showcased some of the pioneering and prominent Ghanaian painters whose works were lined up in the National Museum’s collection. These great artists include: Kofi Antubam, E. V. Asihene, Amon Kotei, A. O. Bartimeus, J. C. Okyere, E. Owusu Dartey, E. Addo Osafo, F.A. Gyampo, Philip Amonoo, J. D. Okae, K. Wiafe Debrah, Kobina Bucknor, E. L. Asa Anakwa, Ablade Glover, Ato Delaquis and Grace Salomey Kwami. There’s the odd gap separating generations of artists, and painting is no exception. Knowledge reflection and heritage sustenance are major reasons this collection was put on display. There’s the need for patronage, inspiration, creativity and love for the art. It’s necessary to rekindle the artistic spirit in the Ghanaian public and re-ignite the discussion on African art that brightened 1940-1990. The exhibition came with a catalogue and intends to promote the documentation of aspects of Ghanaian heritage through painting. As part of extra-curricular activities it is advised that teachers visit the National Museum with pupils and nurture them about the importance of visual arts education. The Exhibition Selection Committee is outstanding for noticing this group of veteran artists who tend to feed the soul and mind with diverse forms of quality presentations of colours merged on canvases telling stories, forming opinions about reality and abstract aspects, driving socio-political details, letting loose their feelings on rectangular plains as such. It is worthwhile to celebrate these legends now because of the pathways they’ve paved by putting some colour over time! 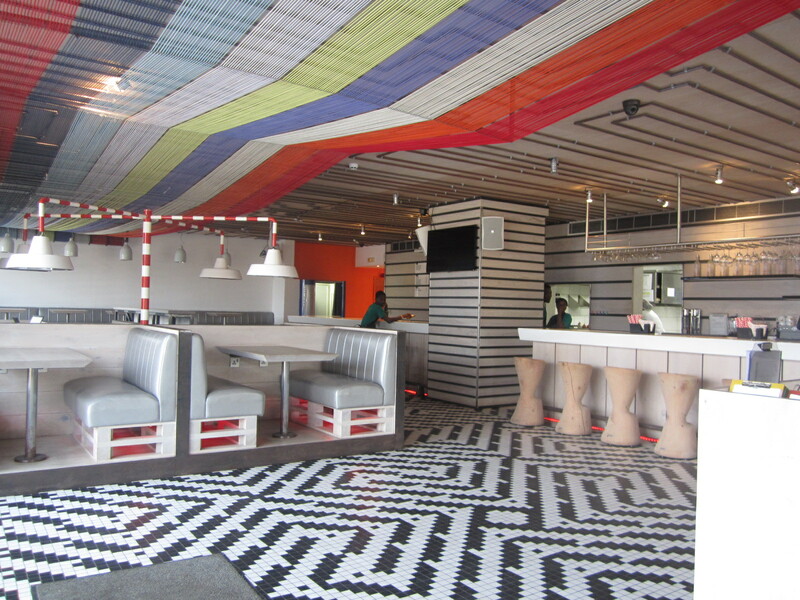 PUBLIC SPACES FEATURE: YARD BIRD; A ‘FLY’ PLACE TO EAT AT! What a sweet place Yard Bird is?! I am one for artistic features included on/in public structures and I admit that there’s no better place to hang out on the Spintex Road during a drive on the main street. It was after I had walked mid-way into the space when I remembered that I’d seen a picture on Deborah Vanessa‘s instagram of her experience at this same restaurant sometime back. Before I get to the fact that Yard Bird mixes American-style diner food with Ghanaian spice, let me mention why it’s a necessary addition to the fast food joints in the area and how it’s beautifully placed in the middle of the afternoon traffic-dense Spintex Road to grant nutritious plates and drink-ables to tired drivers, shoppers, passers-by and business folks in the area.. I had seen the unique style of architecture which props the building into a stick-out concept in the area of the Coca-cola roundabout where the sidewalks are married with a mosaic blend of industries and warehouses aside offering ample space for residential accommodation and big business. A pillar in the front which poses more of an art installation than a branding pier is an eye-candy. 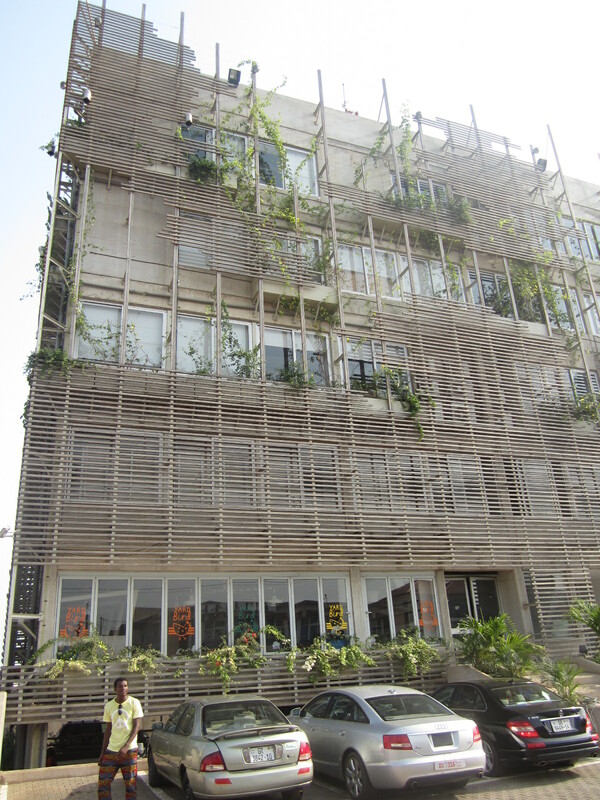 The greenness woven unto the structure itself agrees with environmental -friendliness. There’s no other fast food spot in the immediate vicinity or close proximity with customer-dedication and branding approach like Yard Bird so it’s a GO right?! The ceiling will engulf your attention as soon as you step in the space. 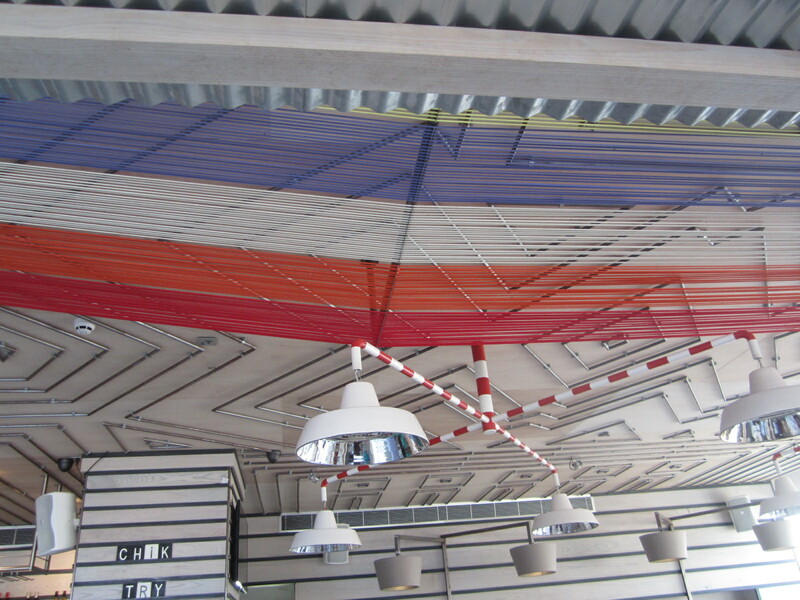 Colourful ropes line one side while the background is layered with geometric blends of metal pipes. One would assume the designers were inspired by the Ghanaian outdoor laundry setting where we usually mount a series of lines to hang clothes as well as the pipeline system that runs on our walls everywhere. The seating spaces are open and very comfortable. 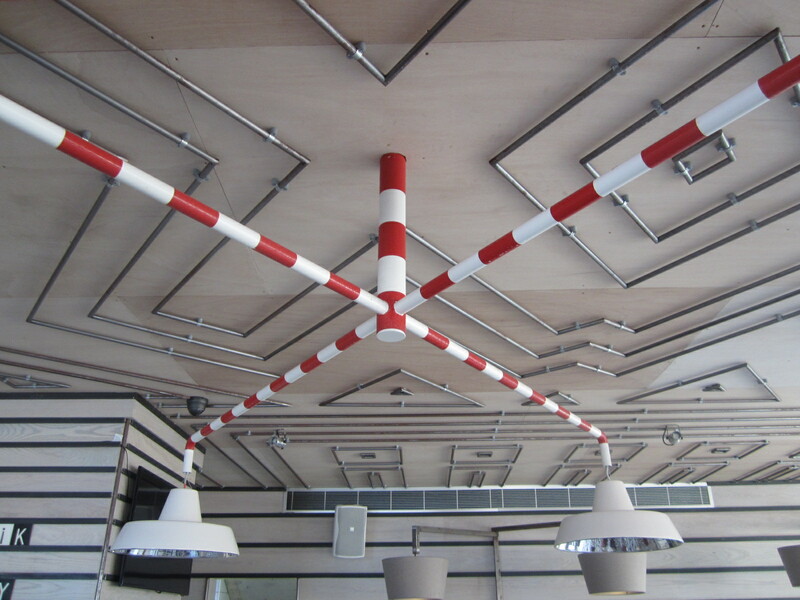 The red and white bases of the tables correspond with the lamp connectors looking like straws intended for drinks. 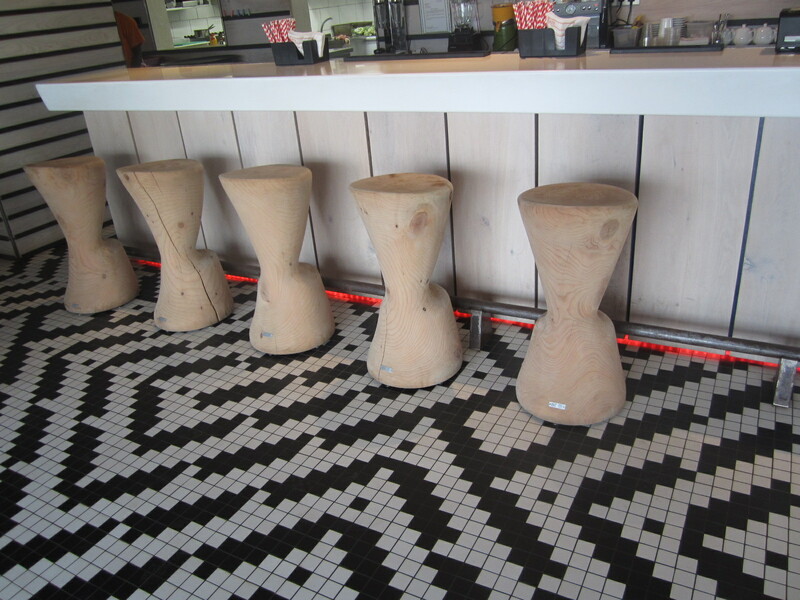 There are stools that look like wooden masher/pepper grinders(locally called tapoli) and oil barrels carved into drawers. The art sense is at peak in the Yard Bird space! 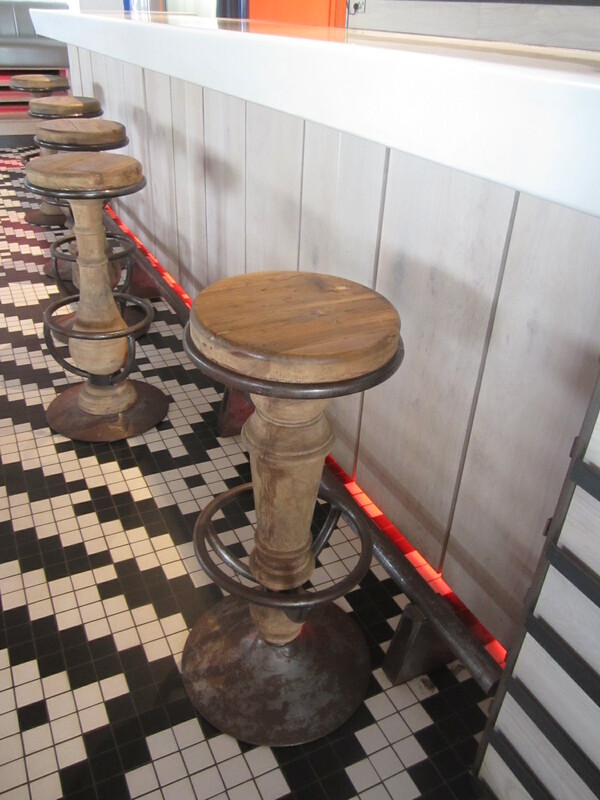 The comfy double seats sit on wooden bases that look like pallets. Concepts like kiosks also exist, giving the space a warm presence like a regular day on the Ghanaian streets splashed with a plush feel. You can’t visit Yard Bird and not take a free photo in their photomaton at the far left end of the expanse. From the starters menu to the small fry menu, also the burgers and ribs section, not forgetting the good good extras! 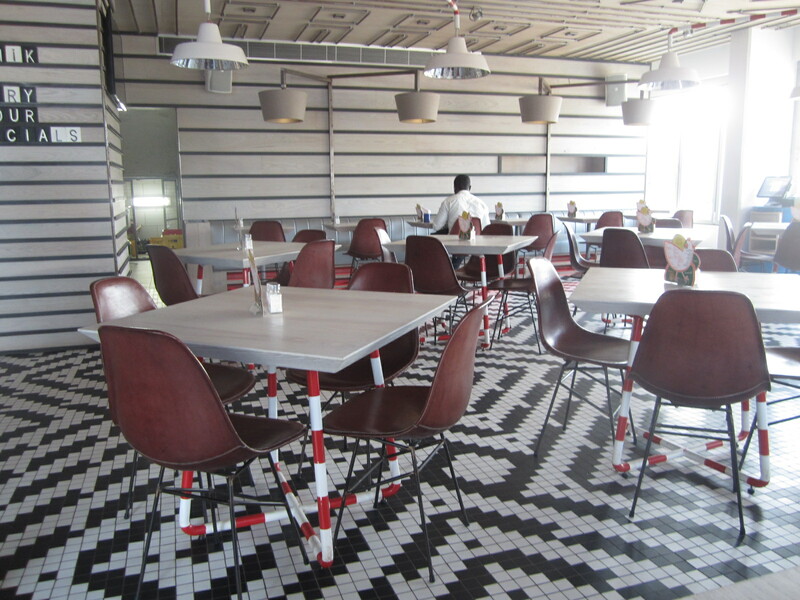 You should try out the signature burgers for lunch! Have a meeting? Have a date? Have a break? Get a taste of the mouth-watering Chicken Chop Chop Salad too! One of the favourites is the Rocky Road Sundae – chocolate and vanilla ice cream with homemade marshmallows!! They have this healthy moringa-induced drink you shouldn’t forget to ask for. Their prices are moderate though. Next time you skirt around the Spintex Road, venture the YARD and go taste the BIRD! Author Kwame 'Write' AidooPosted on February 17, 2015 February 19, 2015 Leave a comment on PUBLIC SPACES FEATURE: YARD BIRD; A ‘FLY’ PLACE TO EAT AT!